Hi, y'all. I didn't intend to blog for a few days, (writing, writing, writing Book 3) but then some news broke yesterday and my tweeps are going wild and I thought I would clear some things up. Yes, it IS true. Unearthly is being developed into a television series for the CW! This is so unbelievably exciting and surreal for me. I love the idea. 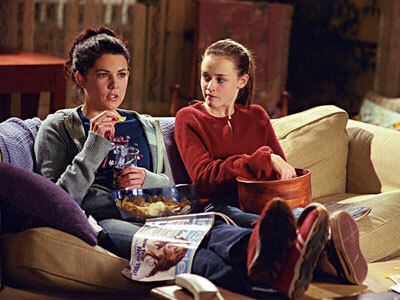 I have been an avid CW watcher for a long time, my fave show for years and years being The Gilmore Girls. There's nothing like the rapid-fire dialogue from that show. <3 In fact, Unearthly was influenced quite a lot by Rory and Lorelei--I wanted the relationship between Clara and Maggie to be fun and friend-like and snappy like this (and there is a reference to the GG in the book, can you find it?). So I am soooooo pleased that my little book is being developed into a show for this network. That said, it is being DEVELOPED into a show on the CW. This does not mean that it is definitely going to BE a show on the CW. Unearthly has a lot of hoops to get through before that happens. Right now we're still in the script phase-- Kevin Murphy is writing a what-I-am-sure-will-be-awesome script for the pilot. Then the network has to greenlight the pilot to be made, it has to be cast and shot, and then the network has to decide if it makes it to primetime. Like I said, lots of work ahead of us. So keep your fingers crossed, and thank you for all the squees and excitement and good wishes. P.S. The entries for my Hallowed/Halloween giveaway are AWESOME. Keep them coming. I will announce the winner at 6pm Pacific Time. now: write, write, write, write, write. Book 3, book 3, book 3. Just wanted to let you guys know, since a lot of people are still coming to this post and getting excited, that Unearthly didn't make it to the pilot stage last February. :( Such is the business. So we are basically back to square one with the Unearthly-to-film-or-television stuff. Thanks for all your enthuiasm and support, and if news on this front changes I will let you know! Waaaaahhhh! So cool! I've never been interested in CW shows, but I would definitely watch Unearthly if it was on TV! But I was wondering if we were allowed to enter both contests? Holy... swear word! That is a huge deal, congrats!! That's so amazing. A HUGE congrats! I love so many CW shows, Hart of Dixie is my absolute favourite right now. Congrats again! Is there anything we can do to support it in these early stages? OH. MY. GOSH!!! That would be SO AMAZING, Cynthia! I'm honestly crossing my fingers and my toes and my legs -- I'd try to cross my eyes too, but I can never do that LOL -- just in hopes that it happens! I LOVE the CW too because they have so many of my fave shows on it! Congratulations! This is such an exciting news! I have faith it will make it on the air. The book has everything to become a hit TV show on the CW. I'm pretty sure this will have a huge following, just like The Vampire Diaries. Good luck to everyone involved. Are they planning this for the 2012 fall season? "for the movie in your mind"
Who do you think would be a good actress to play Clara and a good actor to play Tucker?? I just came across this post and first of all, I wanted to do cart wheels when I read your Gilmore girls blurb in unearthly.....that is my all time favorite tv show! I am so excited about your show possibly being on the cw. I love the vampire diaries, supernatural, and the secret circle. I think unearthly would make a fabulous addition to the network and I hope to see it come to fruition! I am in LOVE with the unearthly series so if it is turned into a tv show would I be able to watch it over here in the UK ??? Will the third book have some tucker in it? I'm actually really interested to see Unearthly on the CW. I really want this to happen, just so i can see what happens. If TVD is any indication, the CW won't stick to the plot of the book series at all, but I still want to watch it.